Planar Chaos should be arriving on MODO sometime in mid to late February. I’m impatient, but until it arrives, I will be playing Standard (and a bit of Extended, but that’s another article.) Today’s Standard metagame is worth looking at, mainly because it will be the starting point for the Standard to come. A few weeks ago, I started seeing a new deck that was winning by preventing an opponent from untapping, while untapping itself. This deck was backed by counterspells and some removal. It felt like Stasis – the deck from pre-2000 Extended tournaments that I hated most. Stasis was the most reviled deck in the format in those days – and since those days were the height of Trix, that’s saying something. Since this website is all about online, and those decks were played with paper only, I should probably explain the decks. I won’t. None of those decks is ever going to be online. Trix relied on two Ice Ages enchantments – Necropotence and Illusions of Grandeur – and Ice Ages won’t be reprinted online. One reason, as I understand it, is that Wizards only purchased the rights to use the pre-Mirage artwork for a limited time. While that made sense then, considering that the game was only a couple years old at that point, it means that Wizards would have to re-license all that artwork to do an online version. They could, but it require a lot of effort and expense. I’d rather see them put that sort of investment into MODO version 3, not putting Ice Ages online. On the other hand, I would love to bust Alliances boosters again. The neo-Stasis deck (called Soggy Pickles for reasons not worth reciting) achieved it’s lock by getting Brine Elemental into play. When Briney is turned face up, the opponent does not untap. To maintain that lock turn after turn, the Pickles player plays a Vesuvan Shapeshifter. 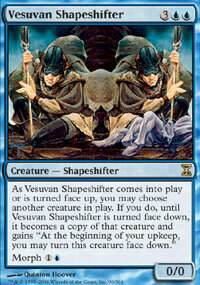 Each upkeep, the Pickles player can turn Vesuvan Shapeshifter face down, then unmorph it for 1U and copy Briney. The Shapeshifter / Briney triggers, and the opponent never untaps. 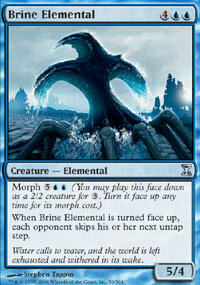 The downside is that the deck has to dig for the Brine Elemental and Shapeshifter. Some of the digging was accomplished by playing Fathom Seer as well – a Shapeshifter could keep copying him to draw more cards (albeit at the cost of stunting your mana.) Worse, however, is having multiple Brine Elementals in hand. Those things are expensive to cast and unmorph, and you really don’t want several in hand, ever. Soggy Pickles is a very powerful deck, and it beats Dragonstorm and much of the rest of the metagame. For a week or so it was the dominant deck in standard. I was really pissed off. I hate Stasis, and everything that smells like Stasis. Fortunately, when Wizards reprinted a neo-Stasis, they also reprinted the one card that really hosed Stasis, back in the day. In 2000, I fought Stasis with Quirion Ranger tech. In Time Spiral, Quirion Ranger returns as (Scryb Ranger.) The relevant ability – to return a forest to your hand in order to untap something – is still there. The Lawnmower Elves and Scryb Rangers are absolute givens in this deck. The Birds are pretty standard, since they are evasive beaters if enchanted. The deck wants at least eight, and up to twelve, one mana creatures that tap for mana the next turn. After Llanowars and Birds, Boreal Druids usually get the nod, although decks that splash for black like Elves of the Deep Shadow. All of these creatures can beat, especially with Blanchwood Armor or a Cloak, and they also help power out a very fast Spectral Force. The deck loves Silhana Ledgewalker, since it beats for a bunch when enchanted, and cannot be targeted. It also wants additional beaters. Some versions run Dryad Sophisticate, who is nicely powered and quite evasive, but can’t dodge removal and Repeals to save her cute little a$$. An alternative is Ohran Viper, which can draw a ton of cards and be quite painful to block, and has fewer problems with removal. (“Fewer” in that it does not die to the Darkblasts that clutter sideboards everywhere. Repeal still works.) 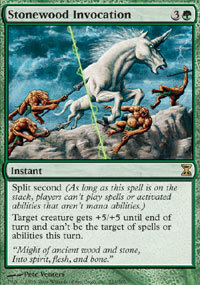 Other versions of MGA run (Call to the Herd) to provide some minor resistance to counters, removal and Wrath of God. The deck runs some serious pump spells. Stonewood Invocation is amazing. It provides a nmassive power and toughness boost, makes the card untargettable and it has split second. About the only answer opposing decks can have is Willbender, which can divert split-second spells. The sideboard contains some givens. Krosan Grip is probably the best Naturalize version available, since Split Second means it will almost always resolve. It is useful against Glare of Subdual and decks that sideboard in problems like (Teferis Moat.) Gather Courage is useful against decks that try to Darkblast your creatures, and it works even if you are tapped out turn one. Spike Feeder buys time against Boros and so forth, and also provides some combat tricks. The rest of the sideboard is more a matter of personal preference. One options is to stay straight green and run answers to potential problems using green cards and artifacts. Some people have tried things like Worship or Fortune Thief to beat MGA. Krosan Grip can deal with Worship, but you want Serrated Arrows to kill Fortune Thief. (Tormod’s Crypt) and/or Loaming Shaman can serve as an answer to Martyr and dredge decks. You can also splash black into the deck relatively easily. For a black splash, replace four Forests with Overgrown Tombs, Boreal Druids with Elves of Deep Shadow, and an additional <?xml:namespace prefix = st1 ns = urn:schemas-microsoft-com:office:smarttags />Forest or the Arena with a (Llanowar Wastes.) That, combined with the Birds of Paradise, should support some strong sideboard cards. Chief among those are Persecute, for use against Dragonstorm, Martyr of Sands and heavily blue Control decks like Pickles. Black also allows you to use Shadow of Doubt, the ultimate Dragonstorm hoser. However, those spells have a lot of black in the casting cost, and I’m not completely sure they work off a couple of Tombs and some Birds. An alternative is to splash red for Blood Moon. A resolved Blood Moon can be devastating against the UW Urzatron decks, as well as other multicolor decks like Solar Flare. It is less impressive against Soggy Pickles, which runs a ton of basic Islands. I love Blood Moon, but I’m not sure it’s worth messing with MGA’s mana base just for a BM. However, splashing red also allows your to run Demonfire, and Demonfire is awfully good. Now MGA is a very good deck right now, and has been squeezing Soggy Pickles out of Tier One. However, the rise of MGA has brought about a resurgence of the original UB control deck from Worlds, Dralnu du Louvre. As of this week, it is making a comeback. I have been working on decks to beat it, but I’m not sure what does so far. (Okay – besides MGA with a good draw.) Maybe UB’s dominance will bring Boros decks back into the T8. UB Control can have problems with beat and burn decks, especially if they resolve a Giant Solifuge. This deck runs off Mystical Teachings, which can fetch any nonland card in the deck. The fact that it’s an instant means that it can (and should) be cast at end of turn. Teachings is the card that makes the deck work. For this reason, among others, I don’t see this particular deck wanting Damnation, the new black Wrath of God coming in Planar Chaos. Damnation is a sorcery, meaning that the deck could not search for it with Mystical Teachings, nor does it have room to run the three or four copies needed to ensure drawing one.. The deck probably does not need Damnation in any case: it’s counterspell and removal suite is very good as is. That said, I expect other UB Control decks to evolve to make use of Damnation’s power. Wrath of God is just too good to ignore. I haven’t had time to play with this at all. I have built GB decks that use Stinkweed Imp, but in other ways. I will say that experience shows that a lot of decks cannot handle the reusable flying removal device. The other advantage to this deck is that it can really abuse Dread Returns: just get three creatures in play and dredge (Dread Returns into the graveyard and you have an instant Akroma. My first thought, however, is that I’m not sold on the Hypnotic Specters. Specter is great turn two – but this deck may be short a few black mana sources to make that work. I might consider playing around with that slot. Wall of Roots is my first thought, although Wall is not much of a threat. I would also consider modifying the land mix: Ghost Quarters might be more useful than a random Mountain and the Rage Pits. I’ll have to play around with this. Of course, this deck is good because MGA is everywhere, and Stinkweed Imp is a huge problem for MGA. If this beats up on MGA enough, people will shift to other decks and / or MGA will start running Silklash Spider. If so, this may fade. It’s called metagame evolution, and it will continue week by week. Right now, though, these decks can win. I can kind of see how the dredge deck works...Wouldnt it be feesible to run gaea's blessing, or is that counter productive working against the theme of the deck? I'm playing the Dredge Deck since it was posted and it's fun but really not that great. I lack the expensive duals but the mana base is ok nonetheless. Geae's Blessing would be the bane of this deck, your opponenet would want to sideboard it IN your deck if he could. The whole idea is to fill your graveyard with dredge 5/6 from troll and imp, then cast a troll which is huge, or attack with Svogthos. Having your graveyard shuffled back would mean the deck has to start all over again. The mountain skragg rage pits seem redundant, altho the life of the loam engine is important cause once you start dredging you dont draw any new cards, which means no more land drops. So you need the Loam to make sure you keep the land drops. Excellent work as always, Pete. Keep it up!